A reviewer wrote that the upper fit of the Nike Air Zoom Vomero 12 was better than its previous iterations. Many consumers appreciated the presence of the Flywire cables; they wrote that the upper was more secure because of them. Runners were generally happy with the different color schemes because they allowed more choice when it came to the visual aesthetics of the shoe. Several testers considered this shoe to be a great option for long distances. The mid-sole received some praise for being well-cushioned and flexible. The foam technologies present in this model were lauded for being very responsive. Those with different foot-dimensions welcomed the fact that this shoe came in many width variants. ‘Comfortable’ was a word used frequently to describe the Nike Air Zoom Vomero 12. A consumer noted that the outsole was strong and efficient enough to increase mileage durability. The reflective coating in the upper pleased many runners who needed to be seen when running in low-light conditions. A consumer reported that the toe box of the Nike Air Zoom Vomero 12 was short and tight. The Nike Air Zoom Vomero 12 neutral road shoe was a resounding success, based on many runners’ reports. Most were able to appreciate its comfortable construction, as well as its durable components. They also believed that it was a step up from the previous iterations in terms of cushioning, durability and overall quality. Nike Air Zoom Vomero 12: The Best Cushioned Shoe of the Year? 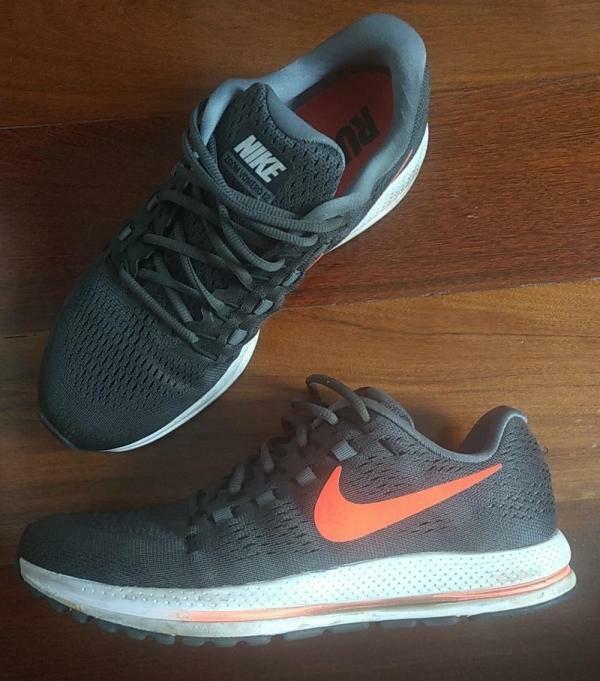 I bought the Nike Air Zoom Vomero 12 due to the recommendation of my girlfriend, which has been using the Vomero since its 8th edition. This is a well built and beautiful shoe with many color variations for both men and women. I chose dark grey. My only “but” regarding the appearance would be related to the side sole, which gets pretty dirty due to its soft and white materials. When you wear Vomero 12, you will feel your feet and shoes as one, everything just connects perfectly and no manufacturing sews and fabric is felt. The upper is also well built, with a dual-layered fabric to protect the toe from the inside and provide a good level of ventilation from the outside. From the photo below, you can see that even after 6 months of weekly usage, the fabric is in perfect shape. Apart from dirt, no sign of usage is shown, restating an overall strong built & quality materials used in this shoe. When I first wore Vomero 12, I was surprised with the amount of softness the Zoom Air technology provided, despite its light weight. As a background info, I was used to cushioning in heavier shoes like Asics Kinsei. In the case of Vomero 12, my overall feeling was having more cushion in a lightweight shoe, a dream to every heavyweight runner like me. In addition to that, while exercising the Nike Zoom Air tech becomes even more vivid from heel to toe, making the steps softer and the energy return stronger. In my case, translating to 10% faster speed in comparison with the Kinsei 5 I was used to wearing. Vomero 12 also does an excellent job wrapping the feet like an envelope, giving a good level of stability for different types of footsteps and soils. And finally, the sole was a positive surprise for me. As I am used to running outdoor and in different soils and weather condition, I need a sole that can handle earth, asphalt, and sidewalks as well as dry or wet surface. And Vomero 12 does a good job in providing a good level of grip for all those cases. Another plus here is the reflective light on the back part, providing a safer exercise for outdoor night runners. Before reviewing shoes, I always like to wait the day after to completely evaluate it not only during the exercise but also its effect on my body. And with Vomero 12 the results were great! Due to its good level of cushion and stability, in addition to its light weight, my legs were fine the day after with no special sore and ache to report, just normal muscle tiredness. The Nike Air Zoom Vomero 12 is the most comfortable shoe I`ve ever worn with its great cushioning, stability, and ventilation. In addition to a strong built and quality materials, it wraps your feet like an envelope. During exercise, the footsteps impact is low and the energy return is high thanks to the Zoom Air technology throughout the shoe. This technology absorbs the impact and returns as energy for the runner, giving more speed during the race and fewer lesions after exercise. In conclusion, Vomero 12 was my best purchase of 2017 and I highly recommend it if you are looking for a lightweight cushioned shoe with a good level of stability. Overall, this shoe looks in pretty good shape and I think you could get at least 300 to 500 miles out of this shoe. The new Vomero 12 has gotten a new update. It's gonna feel a little bit different. It's gonna be nice and soft, yet [sic] keep that responsiveness. I think you guys will like the changes on it. In terms of smooth cushioned ride at slower speeds, upper support and comfort including breathability the Vomero is my pick. The Nike Air Zoom Vomero 12 is a shoe that’s suitable for runners who want to have a luxurious running or training experience. This series has taken pride in providing reliable cushioning to the wearer, and the 12th iteration respects that legacy. Many different color schemes make it a visual treat for those who need more fashionable options when it comes to their running shoes. A well-ventilated experience is provided by the engineered mesh upper. The triple layer knit design improves durability while maintaining breathability and flexibility. The Dynamic Flywires connect the upper fabrics with the lacing system. These lightweight cables adjust the fit to provide a snug yet secure wrap. A full-length carrier foam is present in the mid-sole unit of the Nike Air Zoom Vomero 12. It encases a softer and more responsive foam unit, which actually serves as the underfoot platform for the runner. This ‘carrier’ design makes the mid-sole more durable. It also delivers high levels of cushioning and responsiveness. The Zoom Air pockets in the heel and forefoot areas provide additional protection, springiness and shock absorption. Two rubber technologies are at work in the outsole unit of this daily trainer. One is placed in the heel area, and it’s responsible for affording protection from wear and tear, especially for those who strike with the rear of the foot. The forefoot area has a more responsive rubber material that’s capable of offering cushioning and impact protection on top of the traction that it provides. Standard sizing schemes were used in the making of the Nike Air Zoom Vomero 12. It follows the preferences of runners. The available widths are medium and wide. It accommodates a variety of foot-dimensions. The semi-curved shape of this running shoe adheres to the natural curve of the human foot. The BRS-1000 is carbon rubber and it’s placed in the rear section of the Nike Air Zoom Vomero 12’s outsole. It offers durable protection against wear and tear. It also provides traction, which is important for gaining surface control. The Dura-DS is a rubber compound that’s placed in the forefoot section. Aside from providing multi-surface traction, it also offers impact protection and additional cushioning because of its soft and responsive composition. There are Deep Anatomical Flex Grooves, which accommodate the natural flexibility of the foot. They assist in the facilitation of smooth movements through the gait cycle. A Rubber Crash Rail is added to the lateral side of the outsole. It accommodates smooth heel-to-toe transitions by acting as a cushioning unit in the external section of the shoe. The mid-sole unit of the Nike Air Zoom Vomero 12 has a foam carrier called the Cushlon. It’s a responsive yet durable material that acts as the perimeter wall of the platform. Inside this foam unit is Lunar foam, a soft, lightweight and well-cushioned material. When combined, these two foam compounds are able to give reliable and long-lasting cushioning to the foot of the wearer. Placed separately in both the forefoot and rear sections of this shoe’s platform, the Zoom Air pressurized pockets ensure cushioning and energy return for the runner. The Zoom Air midsole technology is also used in the Nike Air Zoom Vomero 14. The Zoom Air flexes when in contact with the ground and then spring back into their original shape during the toe-off. A molded sock liner is placed on top of the main mid-sole unit. Aside from giving additional cushioning to the foot of the wearer it also supports the curve of the arch, which rarely receives any support. The upper unit of the Nike Air Zoom Vomero 12 makes use of engineered mesh. This cloth-like material has a triple-layer knit for added durability. But it’s breathable and flexible, as well. The Dynamic Flywire system is composed of lightweight cables that are placed in the mid-foot section of the upper unit. They connect to the lacing system. Whenever the laces are adjusted they follow suit, thus giving a snug and secure fit that’s also customizable. An internal bootie that encompasses ¾ of the foot-chamber of this running shoe hugs the foot in a smooth and comfortable manner. It prevents skin irritation, which may lead to blisters or welts. The Comfort Fit Collar provides cushioning to the top section of the foot. Its padded construction also contributes to heel lockdown, therefore preventing any accidental or unintentional shoe-removals. Some reflective detailing allows this shoe to be more visible in low lighting conditions. It’s a good safety measure for those who like to run at night.